A little over a month ago, I was invited to be on a team of writers for the ministry of Ontario to create a document for teachers about coding. Luckily, I did not need to have any previous experience in coding. My students have participated in the Hour of Code each year and we have skyped with a few programmers, but that is the extent of my coding experience. I had no idea really where to begin with my class. With over 30 iPads in my room, my second and third graders are quite tech savvy for their age. They love technology, but they don't really know how it works. I started with finding out their background knowledge on the topic. I asked the simple question, "What do you think coding is?" This lead to a conversation about what algorithms are and how they are implemented as programs on our iPads, computers etc. We discussed how computers don't read the same language as we do. I showed them this blog as the way we see it and then I hit the HTML button to show them how the computer reads it. We then watched a great 5 minute video on Brainpop about computer programming. Tim and Moby explain how programming is just like giving instructions. They explain how people write commands in computer languages called code, and how code is broken down into step-by-step procedures called algorithms. They also show how patience, attention to detail, and the ability to foresee different circumstances and outcomes can turn a lines of text into useful programs and activities. 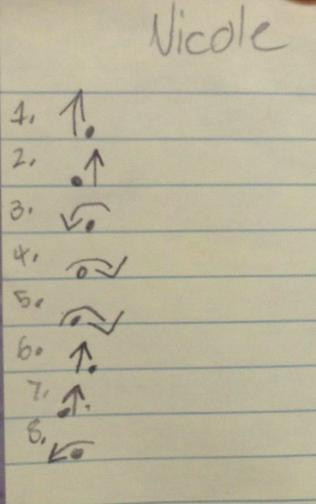 We went over a few simple commands, when I realized that some of my students did not know their right from their left hands. I gave out little counters from our math kit and had each child hold it in their right hand to help them with the upcoming directions I was going to give them. 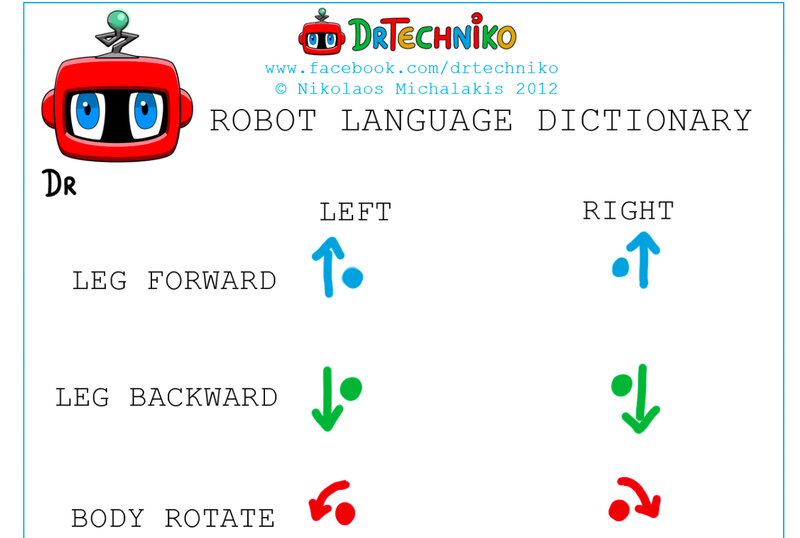 I found a great post by Dr. Techniko where he made a Robot Language Dictionary. I used his same commands for my students. symbols above. We practiced this many times before I gave each of my students a lined sticky note. Their instructions were to write up to 8 lines of code with the commands above. I then put them in partners. One students was the programmer and the other student was the robot. They took turns trying out their code. 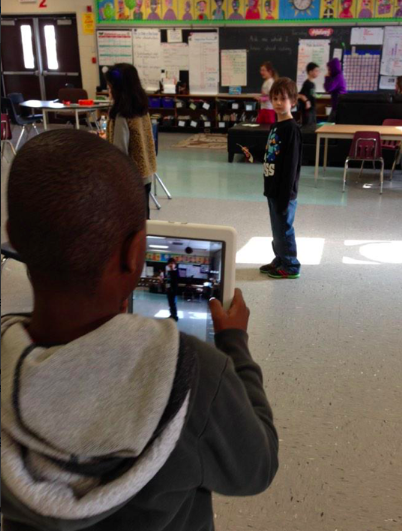 After they had practiced, they took a picture of their written code and took a video of themselves acting out the code. At the end of the day, I could hear the kids talking about how much fun they had and telling their parents that they were learning about coding in class. My plan for the next lesson is to have them complete some sort of obstacle course by programming their robot (partner) to complete it. We will then get into debugging (the process of fixing errors in a program) and I will eventually get them onto ScratchJr on the iPads. Are you programming in your class? I would love to hear about it! As I often say, Piaget would love coding because it coexists in both the concrete and abstract worlds - 2 worlds that are 7 year olds are transitioning between. Thanks for the post Phil! I've been coding with my K class since September. You and I actually spoke briefly about it at SAGE in Winnipeg. We started out unplugged and then moved to using Kodable and Tynker. They're great for introducing the idea of sequencing for a particular end goal (get the coins or the candy). In December for computer science week, our class invited the whole school to try coding with us. The response was positive. We have recently been working on Scratch Jr. My hope is for my students to have their own Scratch Jr project to show at conferences next week. My kids are LOVING coding. We've made so many curricular connections! That is great Meg! I would love to see some of the completed projects. My goal is to use the scratchjr app and tie it into different grade 2 curriculum expectations. I am very interested in starting coding with my K class. Over the past few months I have been reading a lot and brainstorming ways to get started. I really love what you did here, specifically (1) showing the HTML as a spark, and (2) using the interactive robot activity. I am excited that a MOE document is in the works-will it be released as a monograph? My 4-year-old son loves the Bee-Bot app and we've been looking for the actual Bee-Bot robot. Have you come across any for sale in your edtech conference travels? It will most likely be an online resource. I am sorry, I have not seen any Bee-Bot robots for sale. I have seen them on UK blogs and resources online. Keep checking back for more resources. I will try to post the next activity I do with them tomorrow.